This Morro Jabl & Jandia Map shows popular Hotels & Aparments, attractions, places of interest & transport locations. Click the name in the right column to highlight the location on the map. The / Costa Caleta , formally a fishing village and now turning into an up and comming tourist resort, but still managing to retain some of it's old charms. Morro Jable is approached from the north of the island by the main east coast road. 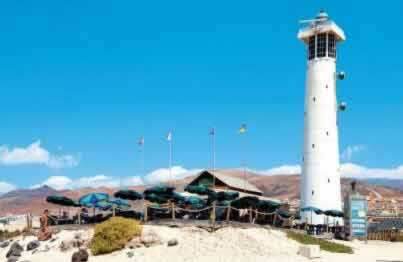 Your first visual contact is the Jandia lighthouse a few kilometers east of the town. 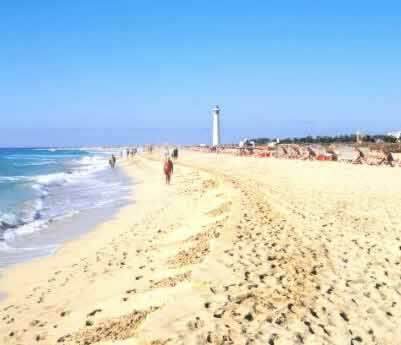 As the road swings into a westerly direction and the beautiful white sands infront of the lighthouse and salt marshes behind are on your left you are on the Avenida del Saladar a smart treelined avenue with cafe,s bars, restaurants, and souvaner shops leading you through Matoral. 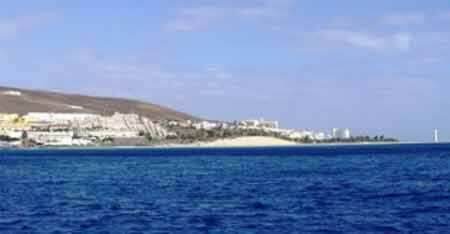 As you head further west towards Morro Jable is the the sea front is paved into a stylish promenade. Keep your eye open for the many stripped squirels in the area. The resort of Jandia is a modern extension of the old town of Morro Jable. Jandia mainly consists of a pleasant Avenue "Avenida Saladar" that runs roughly parallel to the coast. This avenue is lined on the inland side with a series of shopping centres with bars, restaurants and shops. The largest of thes shopping centres is CC Cosmo which is also used as a pick up point for many of the excursions and tours that are promoted on our pages. 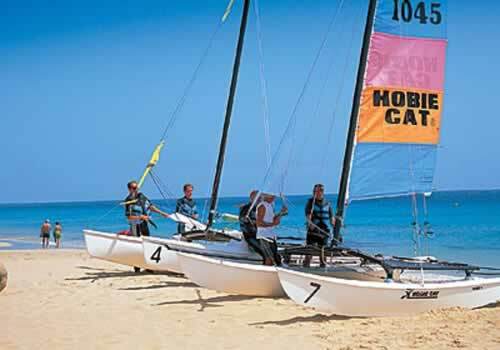 Morro Jable is located on the Jandia peninsula, approximatly 2 3 kilometres from the eastern end of the southern coast of the island of Fuerteventura, Canary Islands, Spain. 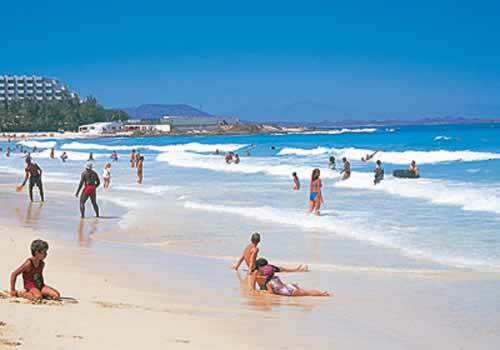 Starting at Morro Jable and stretching 32 kilometers to Costa Calma are the fabulous beaches of Jandia. 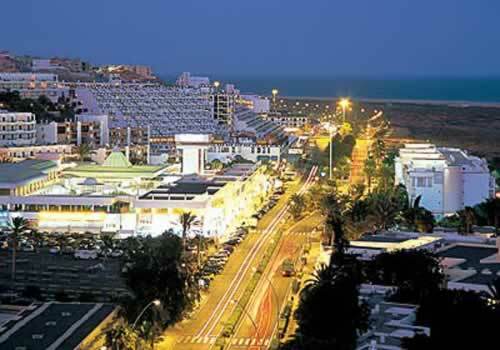 You will find shops in the streets of Morro Jable and the main road into Morro Jable, 'Avenida del Saladar' is full of shopping centres, CC Cosmo being the largest. Besides shops shopping centres also have bars and restaurants and can be centres of nightlife. The El Bucanero De Jandia is an Ideal restaurant to see the world pass by over a cocktail or meal from the covered terrace., or if prefered from inside the restaurant. The El Velero restaurant specialises in Spanish dishes which include goat's cheese omelette and Mexican style beef fillet. The La Casa Vieja Restaurant specialty is flambes beside the more usual great selection of fish, meats and pizzas. The La Casa Vieja Restaurant has indour and outdoor seating & tables. The Posada San Borodon Restaurant is styled to look like a ship. The restaurant serves a wide range of Spanish dishes, fish dishes and also with some international favorites as well. Live guitar music is provided from 8pm. The restaurant is located by the towns rocky cove. 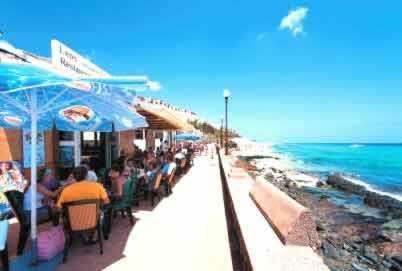 The Restaurant Laja Restaurant is famous for it's fabulous fish dishes such as garlic grilled mussels and fish stew. Their window looks up the beach. The restaurant is not renowned for fast sevice so be prepared for a leisurly meal. Morro Jable does not have a Tourist Information Office. The nearest is at the airport, you can pick up any required information on arrival.